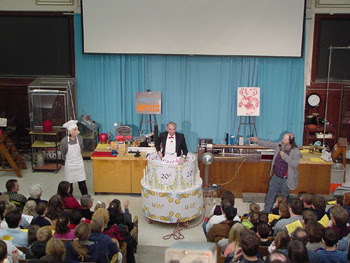 The Wonders of Physics is celebrating its 25th season with several new shows! The WOP has been a staple for years in WYOU afternoon programing; it currently airs on Thursdays at 4:30 pm. The star of the show, Professor Clint Sprott, is coming to the UW-Madison Department of Physics, 2103 Chamberlin Hall, 1150 University Ave, for 4 days, 8 presentations on February 9, 10, 16, 17 at 1:00 and 4:00 pm. Phone into (608) 258-8006 every Wednesday at 4:30 pm. Chat with 8-year-old Luke Kokinos on his half-hour live Skitty Show, and let him know you're watching. Topics range from the latest video games to home-made video skits. Call in and join the fun! See repeats each Thursday early morning at 12:30 am and then again at 10:30 am. Catch the 2007 Celebrating Youth Hoopla Circus all this month here on WYOU. Airs Tuesdays at 9:00 pm, Wednesdays 12:30 am and Fridays at noon.